Pandora (P) has been caught on the losing end of the forces of creative destruction in the music industry yet again. As rumors continue to swirl that Apple (AAPL) may be building out its own music station, Pandora's investors got spooked. Shares of the Internet music company plunged more than 10% Monday. And somewhere, Jack Johnson is crying. Pandora getting hit hard by the latest $AAPL iRadio rumors. $P down nearly 13%. Apple is inching closer and closer to Pandora's turf. According to several published reports, Apple signed a deal with Warner Music Group to gain access to its slate of songs. Could that kill consumers' passion for "free Internet radio:?" Many StockTwits traders clearly think so. $AAPL Secures Warner Music deal will give 10% of ad revenue- I wonder if $P going to dive! $P looking like a short today. Will keep an eye on it for an entry . Pandora was certainly a good company to bet against Monday. The consumer Internet company has had a rocky path since going public in 2011. Sales have been improving, but it's still struggling to be profitable. 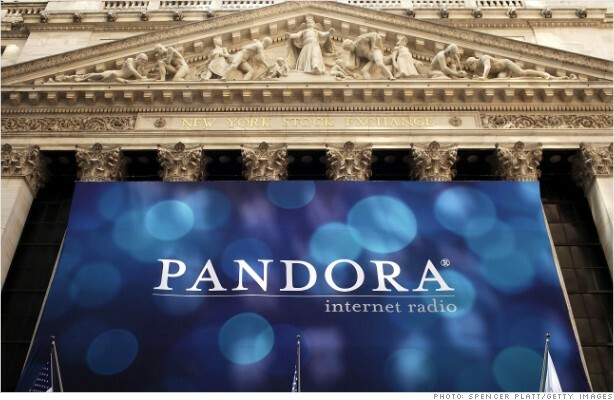 Even after today's drop, Pandora is up 64% in 2013, though it's still trading 5% below its IPO price. Recall after $P's earnings, when people were buying at > $19, and pissed at me for pointing out some facts? yup, time flies. The theory of creative destruction was developed by early 20th century Austrian economist Joseph Schumpeter. Innovation, he explained, kills industries and creates new ones. If he were still with us, he'd be watching the latest music industry battles very carefully.